Location: Outeiro de Espinha, Nr Cunha Baixa. Grid Reference: 40˚ 34' 0" N, 7˚ 45' 0" W.
Anta da Cunha Baixa: (Allée Couverte). As there is no evidence of this ever having had a mound over it, this structure falls into the category of Allée couverte. 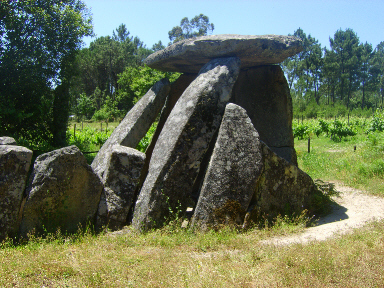 The style of construction is similar to other Portuguese passage-mounds and Dolmens, but the fact that it never had a mound makes it unique as a Portuguese prehistoric monument. The chamber is composed of 9 x 3m high monoliths, with evidence of restoration on several of the stones, noticeably in the passage where several stones have been stapled together. Findings date the site at around 3,000 BC. The masonry of this monument shows strong similarities in style to several other Portuguese 'Anta's'. However, while it is reasonable to say that it is of the same tradition as other important Anta's such as Zambujeiro, Fonte Coberta etc, for some reason unknown, it was decided to leave this one uncovered with soil. 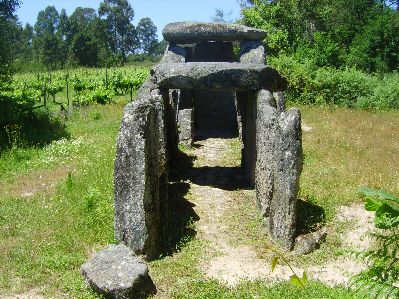 Again, showing strong similarities to numerous other Portuguese Anta's, the top half of the inside right upright appears to have been broken off.